I LOVE FRUITS AND VEGETABLES. But I don’t always love the quality of the fruits and vegetables I find in the grocery store. In my opinion, they are often sub-par. Because I live in Minnesota, I am not all that educated about fresh fruits and vegetables. Our cold climate and short growing season limit our native selections. We rely on “imports” from Florida and California and other much warmer places. That said, I have no idea when growers pick oranges or strawberries or fill in the blank here. How mature, or immature, is the fruit? Are oranges, like bananas, harvested when they are green? How about strawberries? Muskmelon? Is all fruit plucked before it’s ripened? Is fruit really “gassed,” and what does that mean? A few of the Florida strawberries from the pound I purchased. That brings me to the lettuce. I doled out $2.99 for a bunch of Romaine lettuce at the same time I bought the strawberries. Normally I would pass on Romaine priced so exorbitantly high or even consider substituting iceberg lettuce (which I quit buying years ago because I prefer whole wheat to Wonder bread). I was willing, though, to pay the $3. I wanted, needed, a Romaine salad. Unfortunately, the selection was not good. Small bunches. Wilted leaves and leaves edged with black. I chose the best and hoped I wasn’t throwing away my money. I had already peeled off several layers of lettuce leaves before I took this photo. What are those brownish spots? 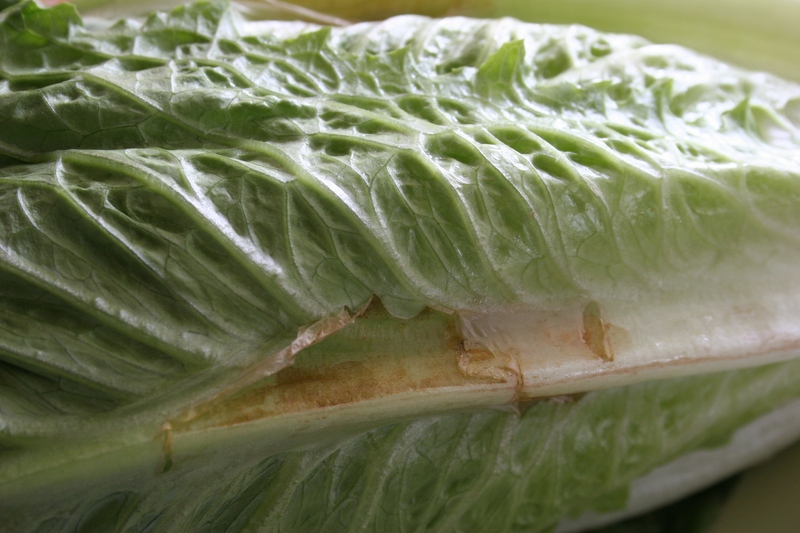 Well, I threw away about three salads worth of lettuce as I peeled off the layers of leaves to reveal what I term “rust.” I have no idea what the brown spots are inside lettuce leaves, nor do I know why leaves are sometimes tipped with black. I just know that I can’t eat it. How many times have you purchased bad lettuce or fresh fruit that ends up in the garbage? I bet you’ve all tasted “baseball” hard peaches or pears and nectarines that never ripen and are as crunchy and dry as cardboard. One bite and in the trash they go. So why are fruits and vegetables like this? 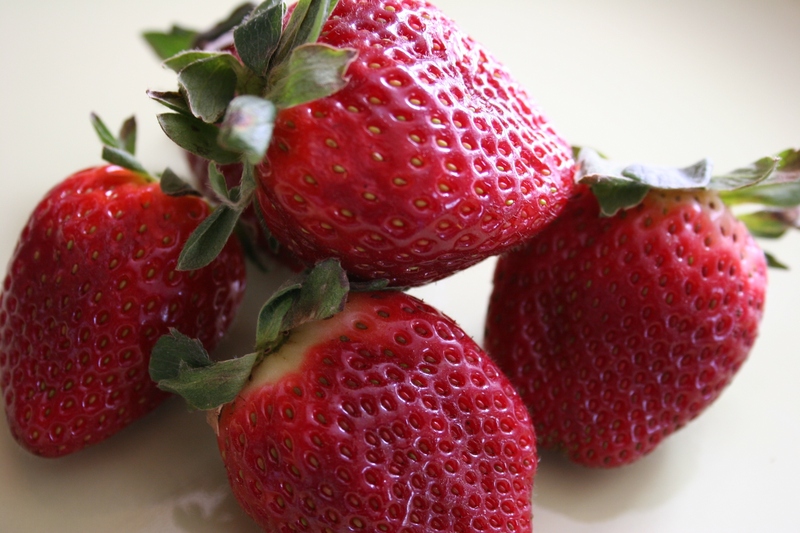 WHAT ARE YOUR THOUGHTS on the quality of today’s fresh fruits and vegetables? I’d like to hear your insights and your experiences. 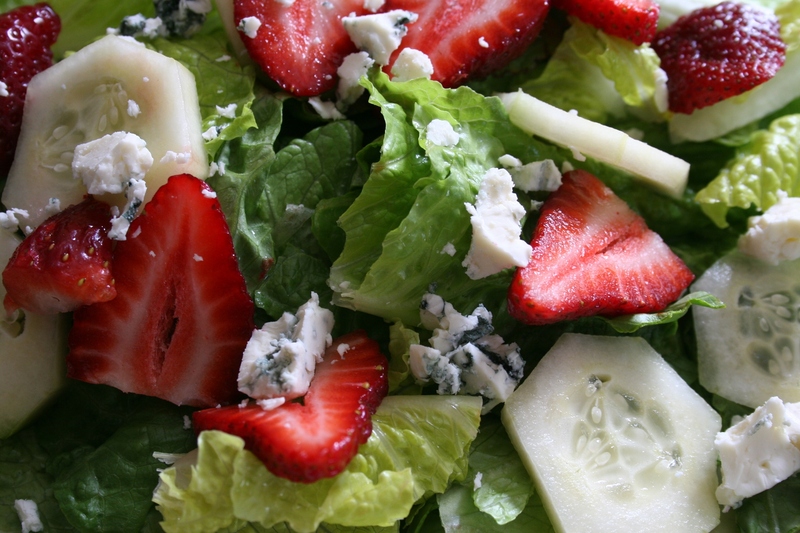 Sliced strawberries, cucumbers and Amablu Gorgonzola cheese added to Romaine lettuce made a perfect salad. I topped the salad with lemon poppyseed dressing. FYI: Amablu Gorgonzola cheese is made at Faribault Dairy in Faribault, Minnesota, where it is aged in sandstone caves along the Straight River. This is home to America’s first blue cheese plant, dating back to 1936. The award-winning cheeses produced in my community are among my favorite cheeses. What a fancy pretty salad. A perfect splash of color in the middle of winter. I’ve come a long ways from thinking a salad was simply iceberg lettuce smothered in Western dressing. I agree. I have had some bad lettuce experiences too. I get everything I can at the Farmer’s Market. Always tastes so much better. Though it is definitely not always practical to get everything there. I shop the farmers’ market too. But we don’t exactly have such markets here in Faribault, Minnesota, in the dead of winter. During the summer I also like to buy fresh vegetables from a local producer. I’m all about watching my food budget too, which means I limit my choices. I tend to buy local, seasonal fruits and veggies. No strawberries ’til I pick my own in the summer, even in MN; though, I’m not a huge fan. I like the apples and pears of the moment and look forward to berries soon. Loads of root vegetables. Some squash. Asparagus should come soon, right? I belong to a CSA, so someone brings it to my house, whatever’s fresh and current. Buying local seems more and more the “thing” to do and I consider that a good idea. But…some fruits we just can’t get locally in Minnesota. Now having veggies delivered to your door would be a nice service. I can’t wait for asparagus either. But that won’t pop poke through the soil here until say May, maybe June this year. I was quite surprised to have bought some strawberries yesterday, as I too figured they would be woody and tasteless this time of year. But surprisingly, they were wonderfully sweet. The final photo of the salad sure does look tasty. You never know with fruit this time of year whether it will be good or bad. I take my chances and hope for the best.